Issues of corruption turn up with disturbing frequency in commercial arbitration. Yet there is no uniformity in arbitral practice to tackle this phenomenon, despite a constant chorus of condemnation from all quarters. This important book attempts to explain the discrepancy between the mountain condemnation of corruption in international trade and public procurement and the persistent resistance to such condemnation. It specifically describes how corruption uses duplicity in practice, and how such practice challenges the imperativeness of condemnation. the degree of judicial review of arbitral awards rulings on corruption allegations. 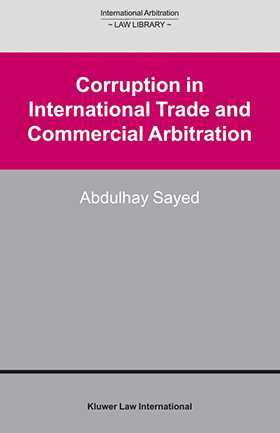 In addition to its matchless value as a guide to law and practice in the field, Corruption in International Trade and Commercial Arbitration is unsurpassed in the wealth of reference material it provides. Important cases from many countries are analyzed with in-depth attention to the circumstances surrounding them, and many national laws (including those of Arab countries) and international agreements are also examined. The entire work is superbly cross-referenced to indexes and a rich bibliography. This book will be of immeasurable value to arbitration practitioners and scholars, corruption scholars and specialists in governmental and non-governmental organizations, officials and experts concerned with money laundering, civil servants in charge of national accountability or transparency bureaus, and law enforcement officials and judges charged with criminal justice procedure in matters of corruption.